Universities have been challenged to conduct research that addresses the needs of people. 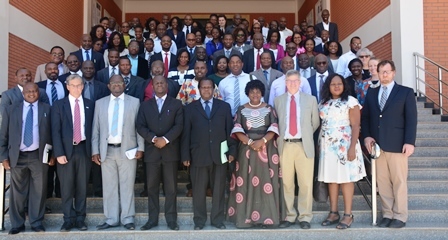 Ministry of Education, Science and Technology Director of Teacher Education and Development Misheck Munthali made the call on Tuesday during the launch of the Malawi University of Science and Technology Innovation Scholar Program (MUST-ISP) at the university’s campus in Thyolo. “We do not want research which ends up on shelves. We want research that tells us what we should do with mangoes, pumpkins and tomatoes which are just rotting. We want research that can help in the development of the country,” said Munthali. Under the two year, several scholars from academics, administration, the industry and students will conduct research to address issues in their areas of expertise. The scholars are being mentored by officials from MSU and LUANAR. MUST Vice Chancellor Professor Address Malata commended scholars under the project for their brilliant and relevant research topics. “One of the scholars is building interlocking bricks using waste plastic, others are coming up with fortified drinks and food. So we are not doing research for its own sake because afterwards we will put their innovations into practice by commercialising them,” said Professor Malata. MSU deputy director of Global Centre for Food Systems Innovations, Dr Kurt Richter said his university will do its best to help MUST solve some of the problems facing Malawians.